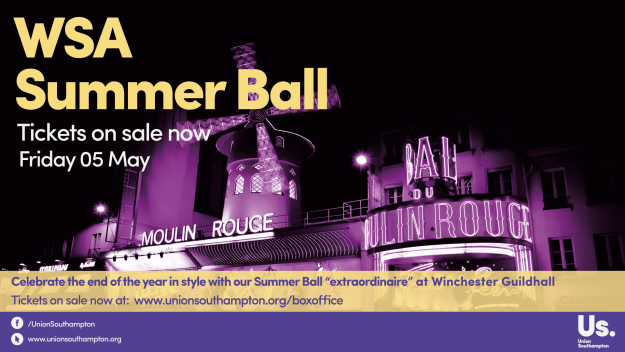 We are delighted to announce that tickets to this year’s WSA Summer Ball on Friday 05 May are now on sale on our Box Office at www.unionsouthampton.org/boxoffice. Our annual summer party will be held at Winchester Guildhall at 20:30. The first 50 guests to arrive can enjoy a free glass of prosecco on arrival. Electro-swing DJ, Jamie Berry, will provide the entertainment with a set to get you on the dancefloor with music from our very own Surge Radio DJs, who will keep you partying until the early hours. Capture the memories on our photobooth and get some group snaps from our photographer who will be circulating during the evening. We will also be offering Domino’s vouchers included in the ticket price to allow you to get some pizza as a late night indulgence after you’ve pulled some shapes. Tickets are priced at £17 each (early-bird) with standard price at £25. Tickets can be collected at the WSA Cafe using your Student ID and email confirmation – simply specify your preferred collection location (WSA Cafe or Union Box Office at Highfield) when you buy your tickets online. More details to be announced. Make sure you bring proof of age ID and your Student ID, along with your ticket to gain entry on the night. « Spring Elections Results: A higher voter turnout than 2016!